History : 12/20/96 : Acquired (free). 06/28/97 : Acquired 2 Model 3s with 48k and Dual Disk Drives for $0.00. 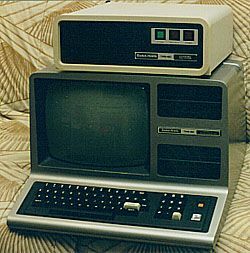 The first micro I ever played with was a TRS-80 Model 1. Spent the whole summer hanging out at Radio Shack playing on the system set up in the store. This is as close as I've come to owning that system. Someone just wanted to get it out of their house (along with a bunch of other stuff) and being the computer pack rat I am, I took all of it off their hands. The model 3 in my collection now doesn't have any disk drives, if someone has a drive kit or knows how to otherwise add drives to it, please get in touch with me. I also have a TRS-80 15 meg harddrive which I'd like to use on this, if you know how please let me know. I've just picked up 2 more Model 3s, this time with dual disk drives. Now I need a copy of one of the Disk Operating Systems for this box and a comm program to transfer files to/from my PC.